The 2018 AAPT-ALPhA Award winner is Natalie Ferris (Dickinson College). Her advisors are David Jackson and Brett Pearson. She will be presented the award at SM19. Additional information about Natalie and her project will be available prior to SM19. The 2018 Area committee of the Year is: The Committee on Research in Physics Education (RiPE). Included among RiPE's notable work and efforts: developing the online application process and guidelines for accepting sessions and workshops, development of creative session formats and development of a newsletter for PERTG and RiPE Communities, thinking critically about RiPE vs. PERTG/PERLOC goals and aligning RiPE goals with the AAPT strategic goals, interactive committee meetings and discussion, development and dissemination of a social activities survey, and the development of new categories for PER submissions. A joint meeting with the National Society of Hispanic Physicists (NSHP), the plenaries, sessions, tutorials and workshops covered a wide range of interests and levels from the novice to the experienced teacher. NSHP sessions included “PER in Latin America and at Hispanic-Serving Institutions in the U.S. and Physics at Hispanic Serving Institutions (HSIs): Challenges and Opportunities. Join us at the 2019 AAPT Summer Meeting in Provo, Utah July 20-24. 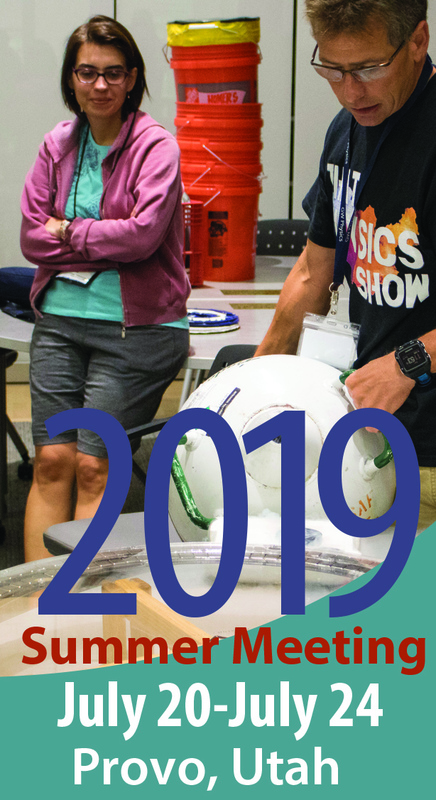 Surround yourself with Physics Educators from around the globe and develop and strengthen professional connections. Hear from internationally known plenary speakers, attend sessions, workshops and special activities designed with you mind. Don't miss this opportunity to share your expertise and learn from and network with leaders in the field. Check the AAPT website for more information as it becomes available. AAPT is now accepting abstracts for speaking and poster engagements at the 2019 AAPT Summer Meeting. The first priority deadline is February 28, 2019. Anything received after this date will be considered post-deadline and scheduled in the last session on the last day of the meeting. Don’t miss out on this fantastic opportunity to present your research and share your teaching methods with other physics educators from around the globe. Click here to view the SM19 "Call for Papers"
AAPT’s summer meeting is expected to draw over 1,200 physics educators from around the globe. Don’t miss this opportunity to have your company stand ahead of the rest. Click here for some exciting opportunities. AAPT Books Program - Calling All Authors! We are interested in hearing from authors who desire to publish books in the areas of physics content, the history and philosophy of physics, physics education research, and the application of pedagogical techniques in physics. Book topics must fit within the AAPT mission of “enhancing the understanding and appreciation of physics through teaching.” We have prepared guidelines to help us evaluate prospective book ideas as we seek a publisher. If you are interested in authoring an AAPT book, please review the guidelines and consider submitting a proposal. Send questions about authoring an AAPT book to eo@aapt.org. The Partnership for Integration of Computation into Undergraduate Physics (PICUP), an informal group of physics faculty from around the country, is committed to building a community of STEM educators dedicated to integrating computation into the undergraduate curriculum. Towards this end, PICUP invites all physics faculty to consider attending the Summer Faculty Development Workshop to be held on the campus of the University of Wisconsin at River Falls, from Monday, July 8 through Sunday, July 14, 2019. The purpose of this week-long workshop is to guide participants in developing their own computational educational materials, and in formulating a plan for implementing these materials in their upcoming courses. If you apply before April 1st, the registration fee is only $100, which covers all housing and meal costs for the entire week! There may also be some limited funding for round-trip travel to River Falls. If you do not have experience with computational methods and programming languages, you are invited to also come for a day-long series of tutorial sessions on Tuesday, July 9th, that will introduce you to the fundamentals of using a computer to solve basic physics problems. These tutorials are intended to get you up to speed on programming and computational basics so that you can confidently participate in the main workshop that will commence on the morning of Wednesday, July 10 and ends on Sunday, July 14. Go to www.compadre.org/picup/ for more details on this workshop and other PICUP events. Department Chairs can send a team to the National Graduate Teaching Assistant (GTA) Workshop for physics and chemistry departments, held May 29-31, 2019 at Georgia Tech. Lodging & meals covered for accepted departmental teams (1 GTA + 1 faculty). Application deadline: 22 Feb 2019. Click here for more info. Register now for March 2-3, 2019! Please help us to identify strategies to close the gap between STEM supply and STEM demand. If you receive a package of surveys by mail, please complete them. If you have not yet received a mailed survey package from The Research Consortium on STEM Career Pathways, please ensure that you and your students are included by filling out this simple online form or by emailing info@studentresearchfoundation.org. Thank you for participating! The 2019 face-to-face Modeling Workshops Cognition and Instruction in STEM, are posted on the website as we receive the information. Workshops have been planned for Arizona, California, Illinois, Indiana, Maine, Massachusetts and Ohio. Workshops are scheduled for physics, chemistry, biology, middle school and physical science. Click here for details. ● AAPT Books Program - Calling All Authors!